AUTONOMY: The curriculum is built around a clear set of values, five key competencies and learning eight learning areas. Richard Wells captures this in a graphic. The support documents provide the ingredients, but leave schools to develop their own narrative. This freedom and flexibility provides a sense of autonomy for schools to respond to their own context and community. This means fluid learning communities, co-teaching and various inquiry-based pedagogies. 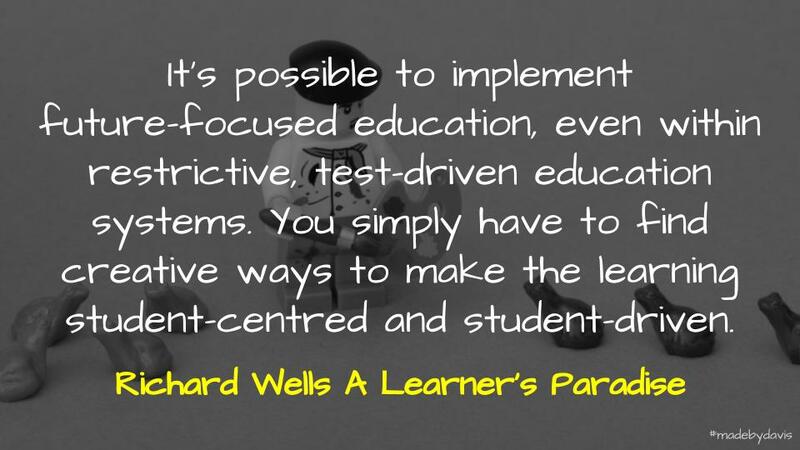 Steve Mouldey provides a great insight into this, while Richard Wells has written a series of posts demonstrating ways of making learning more student centred. COLLABORATION: Alongside choice, there is a focus on fostering the conditions to work collaboratively within clusters. For some this includes meeting between schools to moderate, while others provide connectivity to the community. These approaches are supported by initiatives and organisations such as, Mind Labs. CORE Education and the New Pedagogies for Deep Learning. CULTURE: From the first step into Auckland Airport, the prominence of Maori culture is clear. As an outside, it feels as if Maori culture is at the heart of New Zealand culture. From a dedicated television station, dual signs and descriptions, various forms of customary greetings, and regular reference to art and tradition, the difference to Australian is noticeable. Where it stands out from an education point of view is the use of the Maori language to encapsulate values and attributes. I wonder if one aspect which makes this possible is the presence of a unified living language? Or if it all comes back to the Treaty of Waitangi? Although in Australia there is the Welcome to Country and attempt to recognise the local people of each region, this seems to fall short of the place that Maori culture has in New Zealand. RESOURCES: One argument often made to why Finland is so successful is the amount of time teachers have out of the classroom to plan and prepare. For New Zealand it is the opposite. For example, primary teachers only get ten hours release a term and for some this includes a whole day release which often chews up half of this time. This reminds me of a point that George Couros makes in the Innovator’s Mindset around creative budgeting. Couros talks about the way in which Brad Gustafson makes a line intone budget for innovative projects. A side note to resourcing is the place of community partnerships. I stayed in one town where the local public school had all of the companies that support the school listed on the fence. There seems to be a different relationship between outside organisations and schools, although it was not clear as to how far this went. TRANSFORMATION: It can be easy to read an account or watch a an example from a few years ago and think that is the way it has always been and continues to be. However, what worked yesterday may not be what works today. Some of the New Zealand schools which had been been held up as showcases, demonstrating fluid and visible practices, have continued to evolve and iterate. They take what works and refine what could be better. Interestingly, this is similar to the Finnish story. It can be easy to read Pasi Sahlberg’s account and think that is the way things are. However, even Finland – seemingly at the top of the world – knows that to stand still is to go backwards. At the start I said I was left with more questions, than answers. Some of the things that I was left wondering was what the future had to offer? The government is looking to increase funding for independent schools. Some schools still choosing to reinstate rather than redefine the status quo. Teachers supported but not necessarily in regards to time. The world is becoming more and more multinational/multicultural. It will be interesting to see where this all goes. For some this makes it an incredibly hard time to be involved with education, but I would argue that it simply makes it even more important to continue to fight for what Gert Biesta describes as a ‘good education’. Thanks must be given to me wife who supported writing this by adding her thoughts and perspectives. If you have something else to add, as always comments welcome. New (Zealand) Experiences by Aaron Davis is licensed under a Creative Commons Attribution-ShareAlike 4.0 International License. It looks like an extensive trip Aaron. Looking at the post and some links, I see many familiar ideas, presented in different ways. Cool.